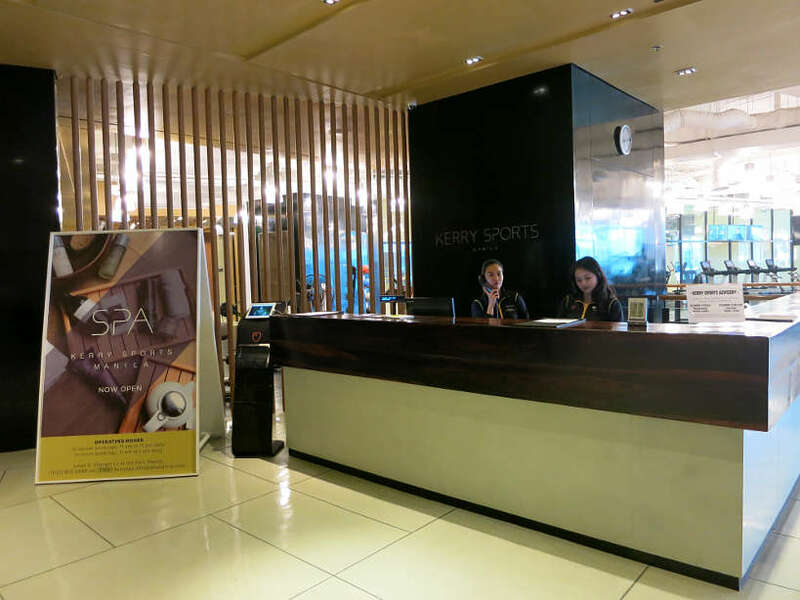 When we walked into Kerry Sports, at the Shangri-La at the Fort in Manila, we were blown away immediately. We knew at that point that all kilos we had put on eating our way through the Philippines, could be burned off using all the fitness and training options available. 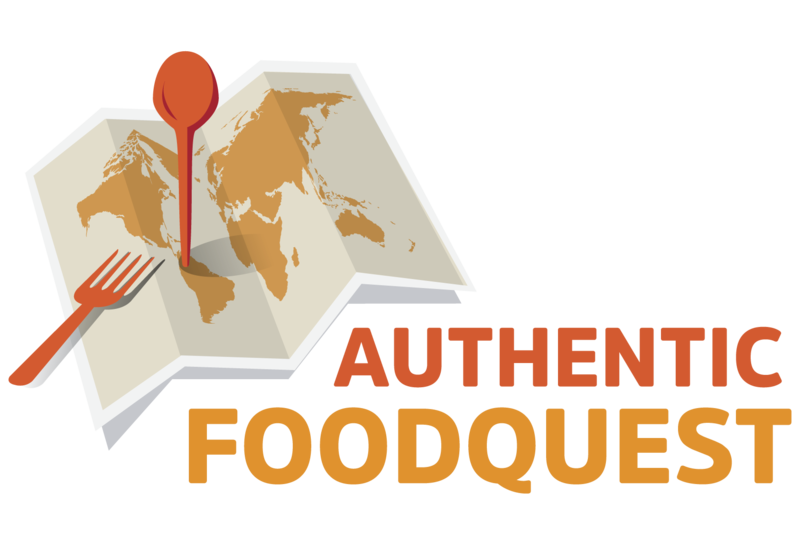 At Authentic Food Quest, we aim to highlight the authentic dishes from around the world and inspire you to travel through authentic food. That means, eating while traveling. 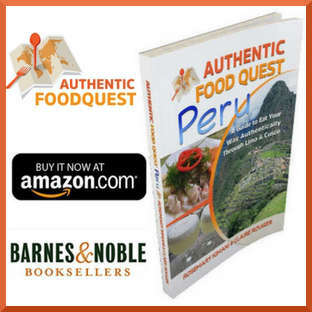 Over time, we have found, that traveling and eating the local food specialties does not have to mean stacking on the kilos. Healthy eating and maintaining your workout when traveling is possible and we look for simple ways to stay fit. The easiest way for us to burn off the calories is by running. This simple form of exercise requires no equipment, besides a pair of running shoes, a sports bra (for women) and a running outfit. Running also gives you the added bonus of exploring the local area. When we were in Manila, the capital of the Philippines, we struggled to find a great place to run and keep fit. In our previous article, how to stay fit on your travels to the Philippines,we share the challenges we faced finding green space and pollution free zones to run. 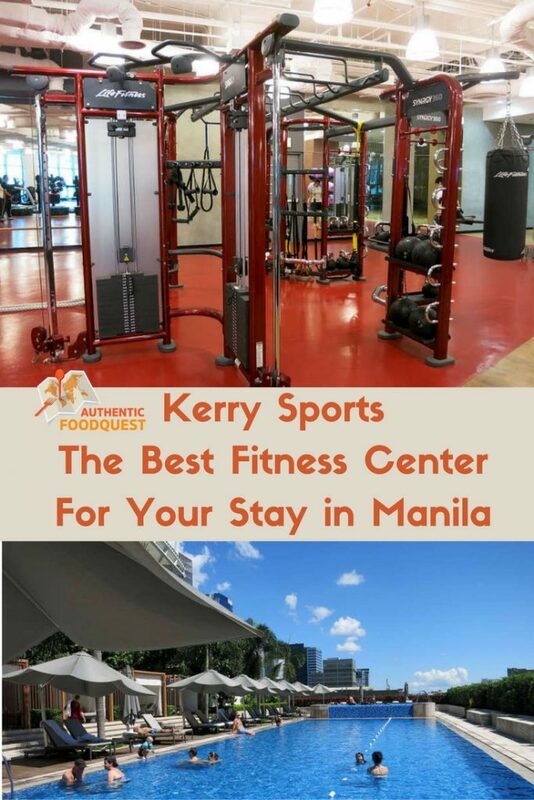 When we learned about Kerry Sports, the largest indoor lifestyle club in the Philippines, we knew we had found our answer. 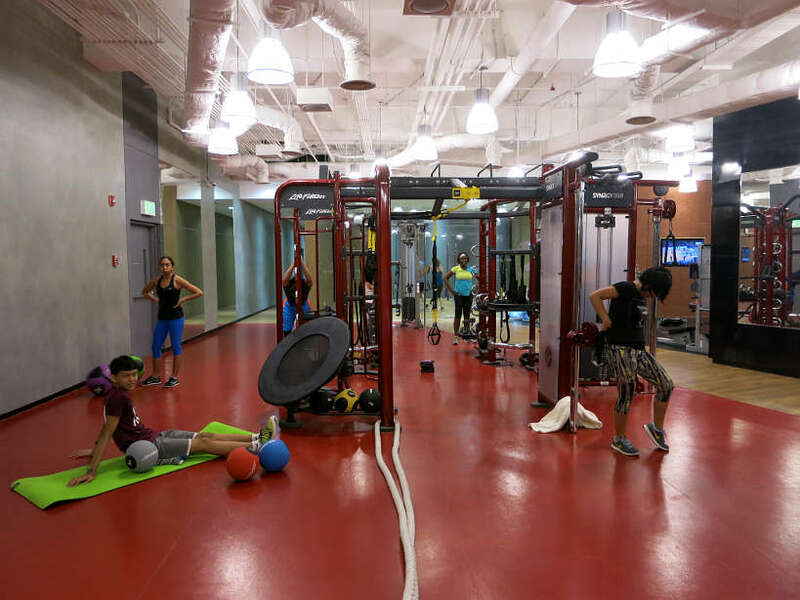 Kerry Sports is not only the largest fitness center in Manila it is also the largest indoor sports center in the Philippines. It is located on the 5th and 6th floors of the Shangri-La at the Fort in Manila. 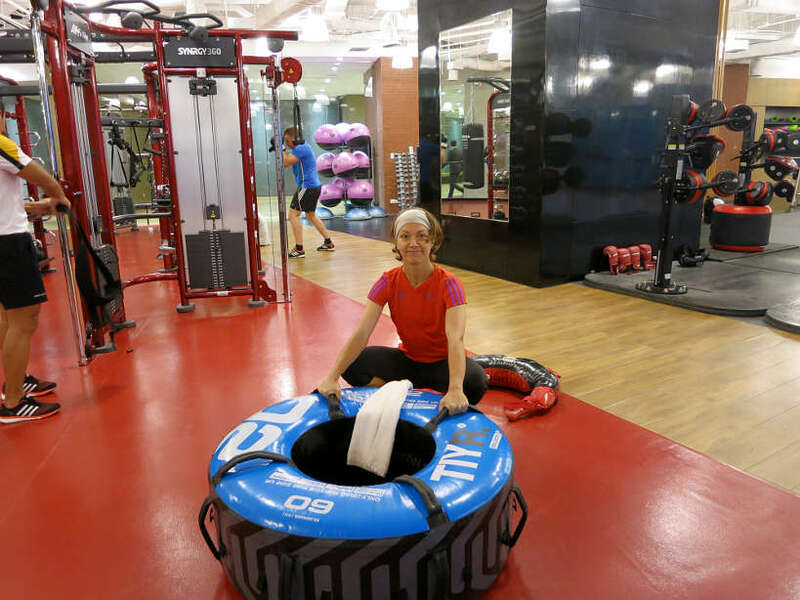 With over 8,000 sq.m (or 86,000 sq.ft), you will find a variety of fitness options for all ages and fitness levels. 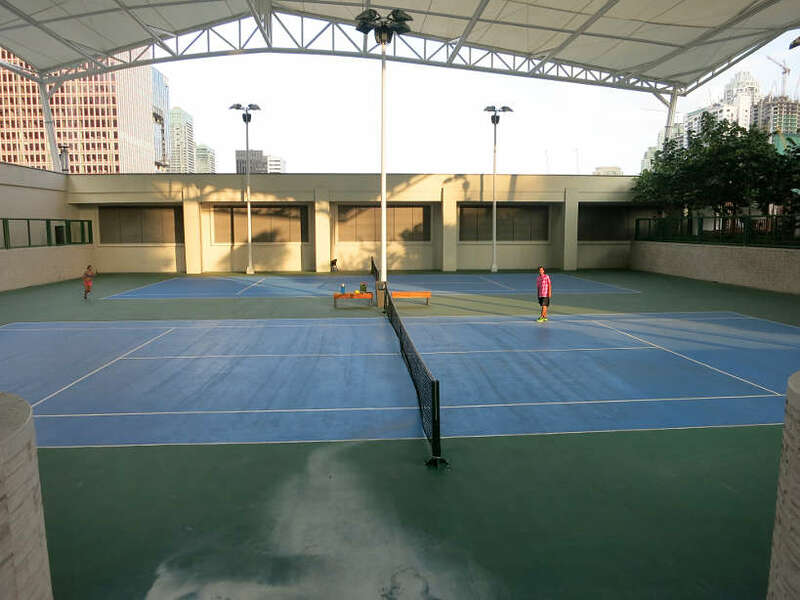 Notably, there is an NBA certified basketball court, for the most popular sport in the Philippines. Kobe Bryant, 5-time NBA champion played at the Kerry Sports Center, Shangri-La earlier in June 2016. To target different muscle groups, Kerry Sports has several training zones to choose from. 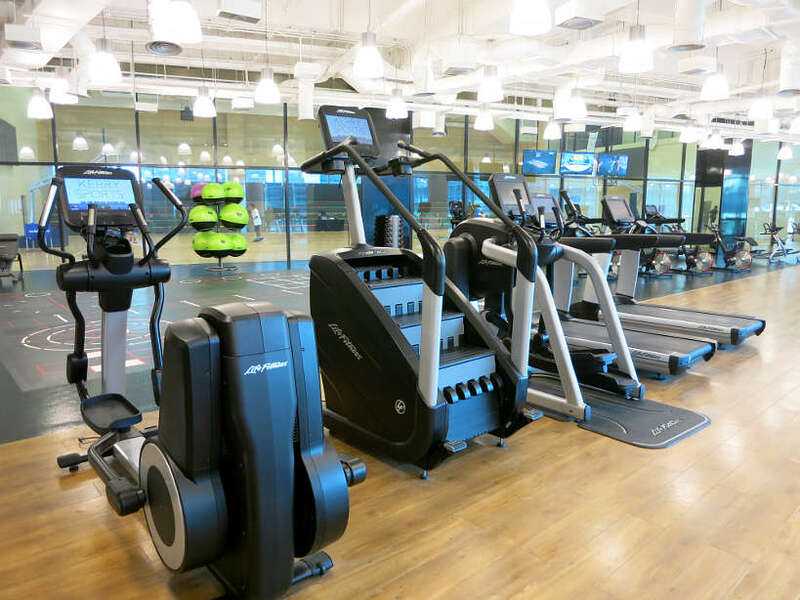 There is cardio zone featuring the latest in treadmills, cross trainers, upright and recumbent bikes. You will find a boxing zone, for the ultimate boxing training system. The free weights zone features the latest selection of dumbbells, barbells, kettleballs, squat racks and more. Interspersed within all the equipment are zones dedicated to working the core. You will find the latest in abdominal and lower back equipement including, Ab coaster, Bosu Leg raise machines and more. 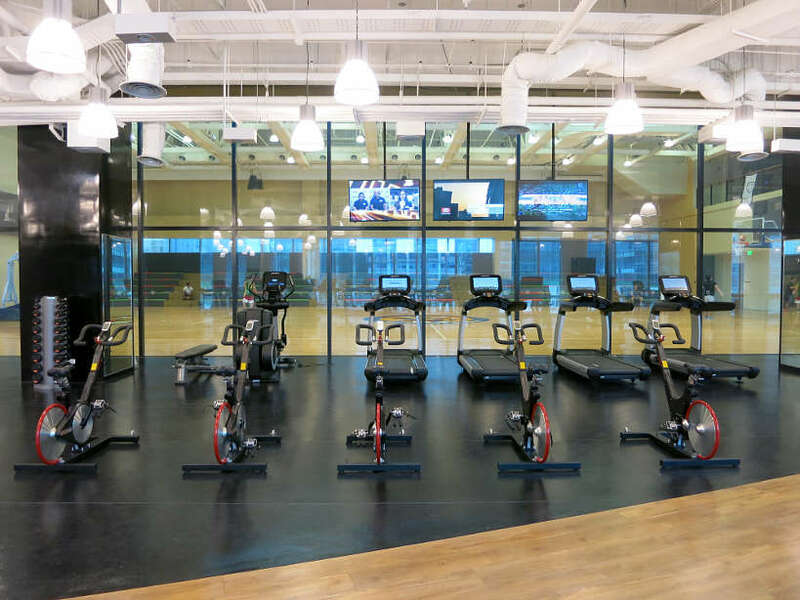 In addition, you will find dedicated studios for group classes such as Yoga, Spin, Pilates, Squash and more. Tennis lovers can play with a Kerry Sports trainer and improve their game in the outdoor covered courts. 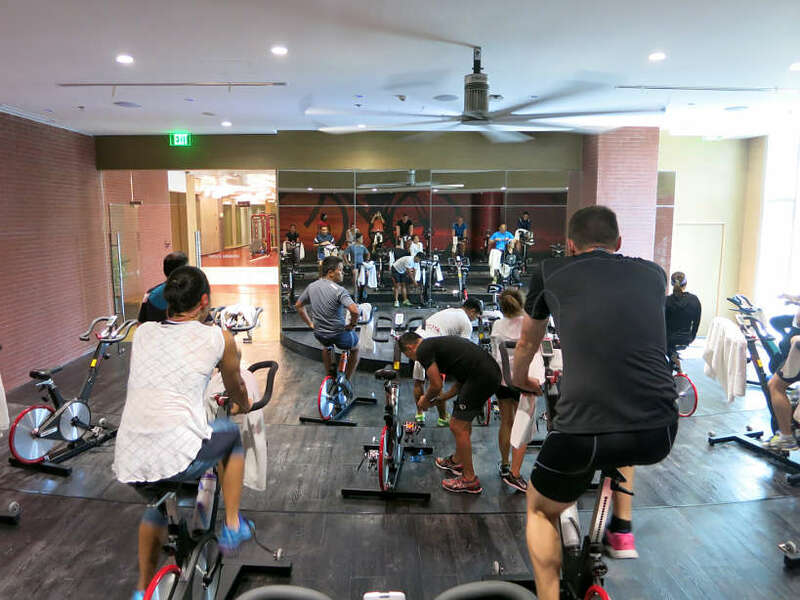 We spent two nights at the Shangri-La at the Fort, and each day was spent at the Kerry Sports trying out different classes and experiencing the fitness center. 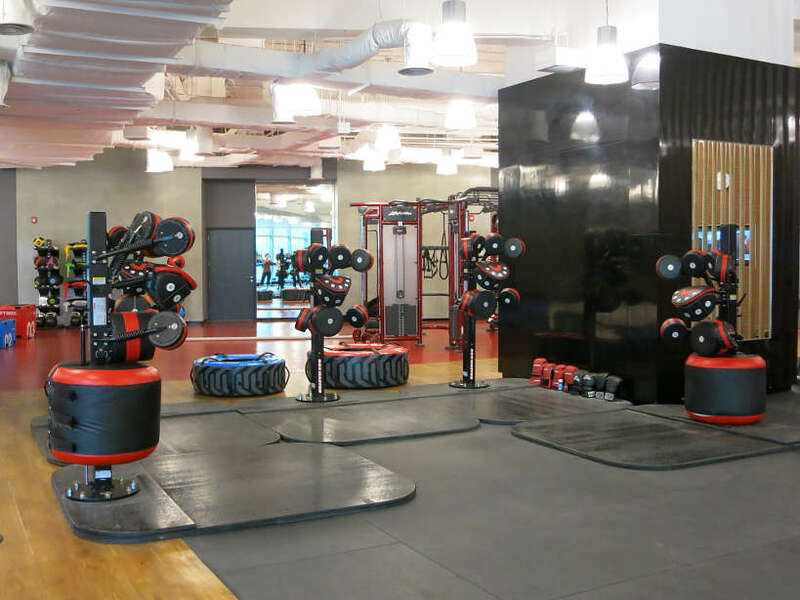 We had never heard of Synrgy 360 before and were intrigued, yet intimated by the huge apparatus with several workout modules. The friendly Kerry Sports trainer put us at ease while demonstrating each workout. 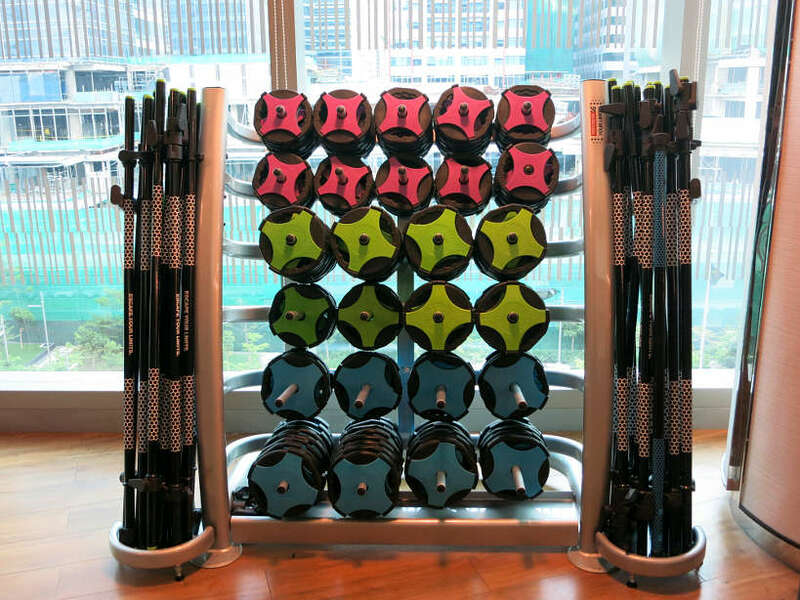 This innovative system combines a variety of dynamic exercises targeting different muscle groups. In a small group of six, we pushed ourselves for about one hour using a non-traditional equipment such as ropes and tires. To stay cool in the hot and humid temperatures in Manila, the pool at the Shangri-La is a great place to escape the heat. This half-Olympic, 25-meter outdoor lap pool is large enough for a serious calorie burning workout. Surrounding the pool area are private cabanas, with comfortable furnishings that you can spin around give you more or less sunlight. 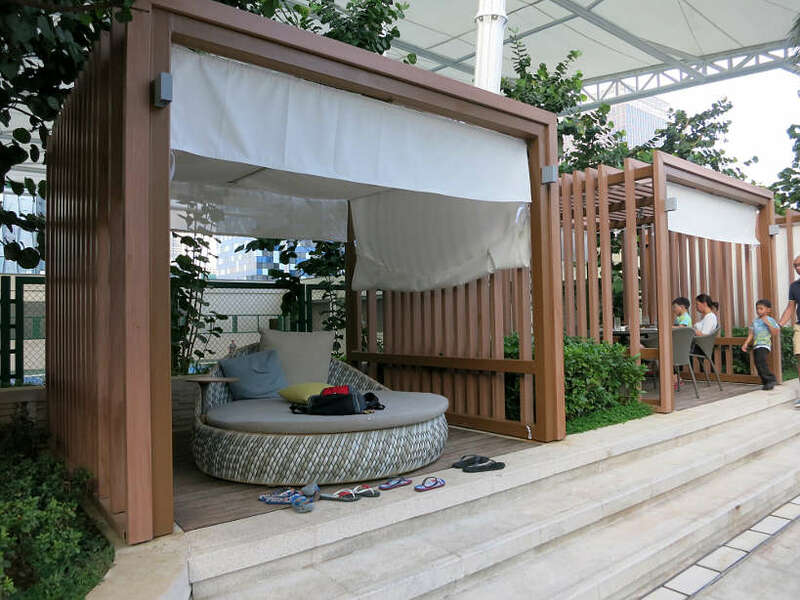 You can transform your private cabana into a relaxing space after your workout. The staff attendants are incredibly helpful and are on hand to give towels, food, snacks and constantly replenish your drinking water. 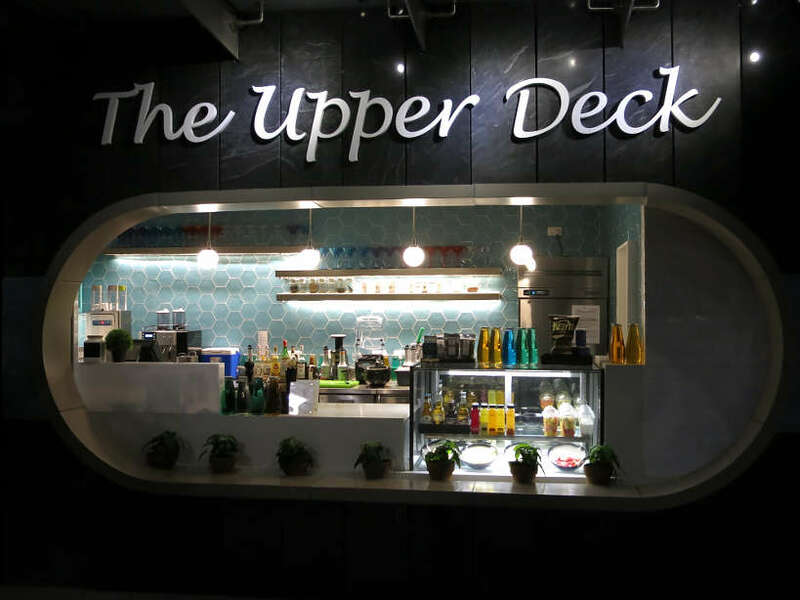 On the swimming pool level, you will find the Upper Deck restaurant where you can lunch or dine by the pool. You have options from guilt-free salads all the way to delicious burgers and fries. 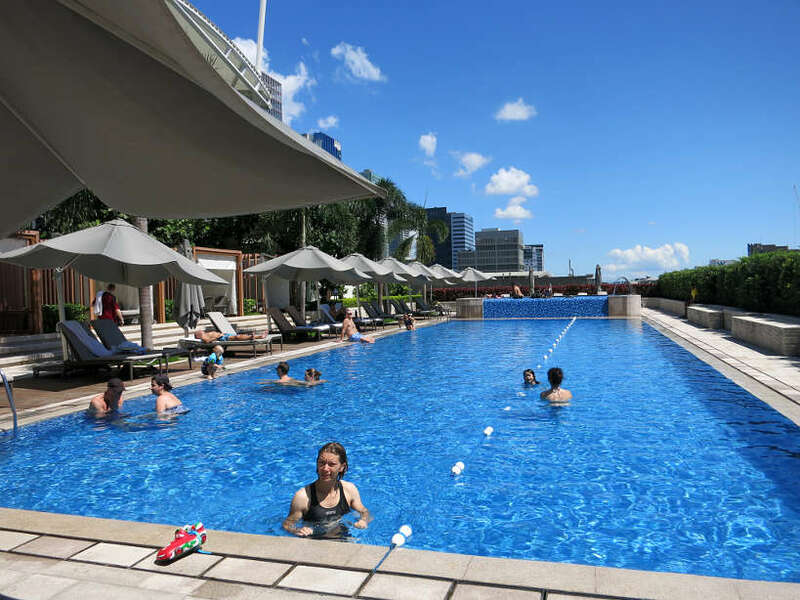 We enjoyed a lazy afternoon relaxing by the pool after the strenuous Synrgy 360 class that morning. Breathing in the fresh air and appreciating the silence, was a needed respite from the hectic pace of Manila City. Pumping to music and pushing yourself to new challenges is what you will get from a Spin class at Kerry Sports. The instructor will “push” you through hills, sprints and endurance rides, with music pumping to get you going. This class is accessible and depending on your fitness level, you can choose to push hard or go at your own pace. To relax your tired muscles, Kerry Sports has relaxation rooms attached to the men and women’s locker rooms. 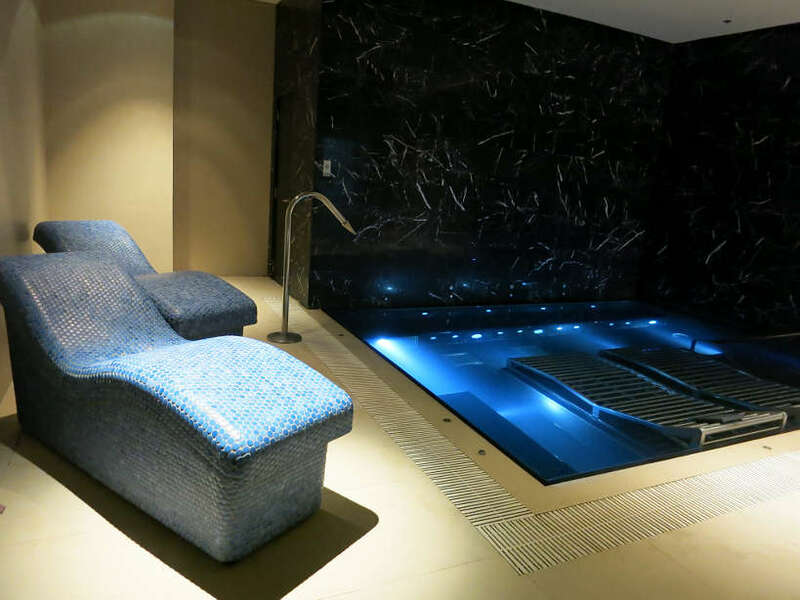 This includes a steam room, sauna and vitality pool. After the challenging spin class, we took the time to relax the muscles and improve the circulation of our tired muscles in the steam and sauna rooms. Our favorite part was the vitality pool. This little pool is equipped with air and water jets that leave you feeling relaxed and invigorated. A really nice and special touch! On the morning of our departure, we started the day with a yoga class at Kerry Center. The class offered that morning was Vinyasa yoga. This was Claire’s first yoga class ever, and Rosemary’s second Vinyasa yoga class. In a class of about 20 participants, our instructor, Anna guided the class gently, maintaining the body/spirit connection. Rosemary who is not flexible at all, appreciated the personalized adjustments made by the instructor throughout the class. As a first timer, Claire was able to get into the flow the class, with ease. 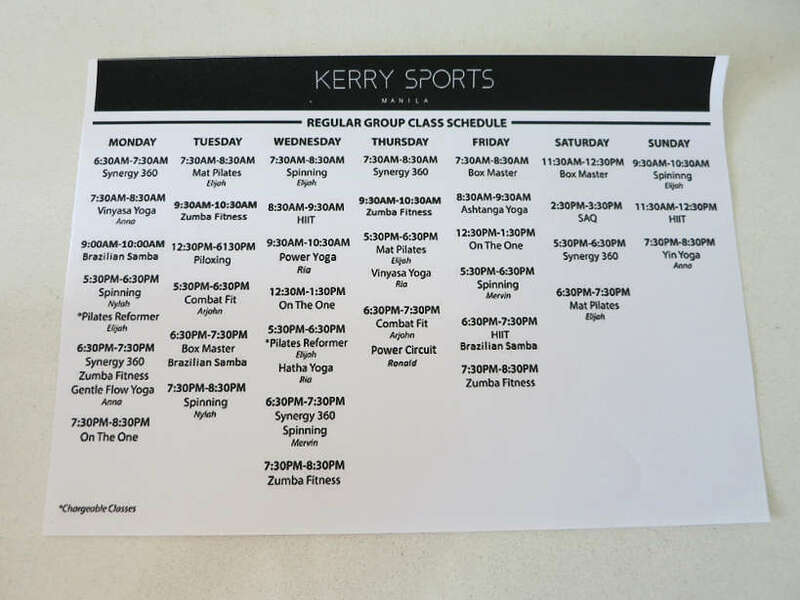 Yoga lovers can choose from several different classes at Kerry Sports. Be sure to pick up the latest schedule from the facility. If hunger hits while working out at the gym, Kerry Sprouts Café has you covered. 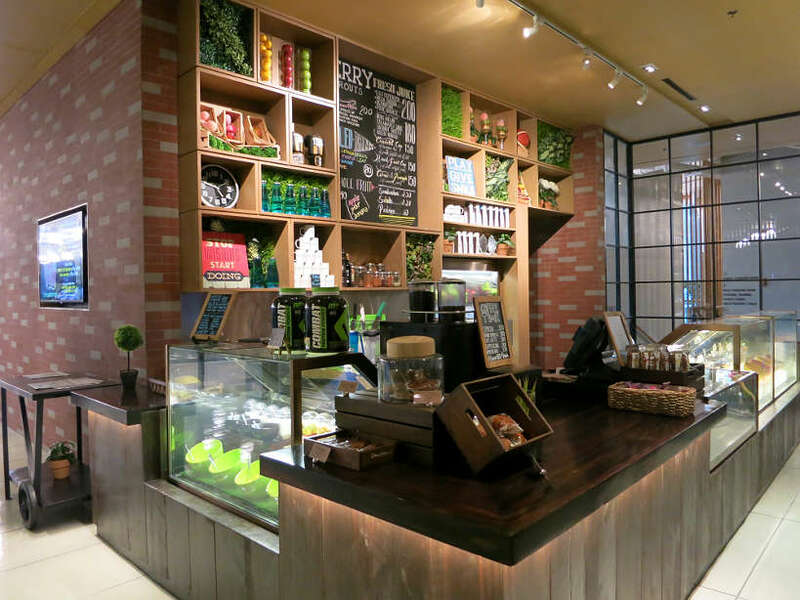 This health and fitness oriented cafe has protein shakes, fresh fruits, healthy salads and snacks to keep you going. One treat that we enjoyed at Kerry Sports was the bar of flavored waters. 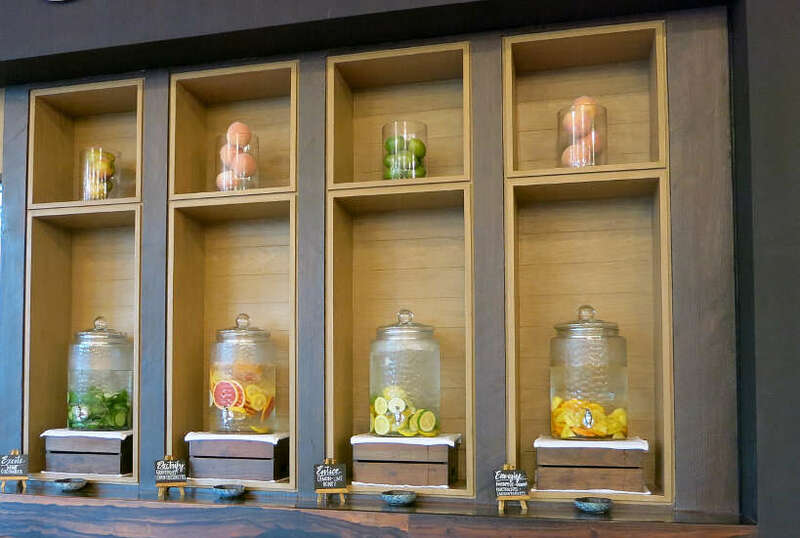 To keep you drinking water and staying hydrated, you can choose from different types of flavored waters. You will find exciting flavors like: mint and cucumber, pineapple and orange and grapefruit, lemon electrolytes. For your own private relaxation space, The Spa at Kerry Sports, offers a variety of holistic spa treatments to help you restore and recharge. You can choose from restorative massages to skin care and body treatments inspired by traditional Filipino techniques. 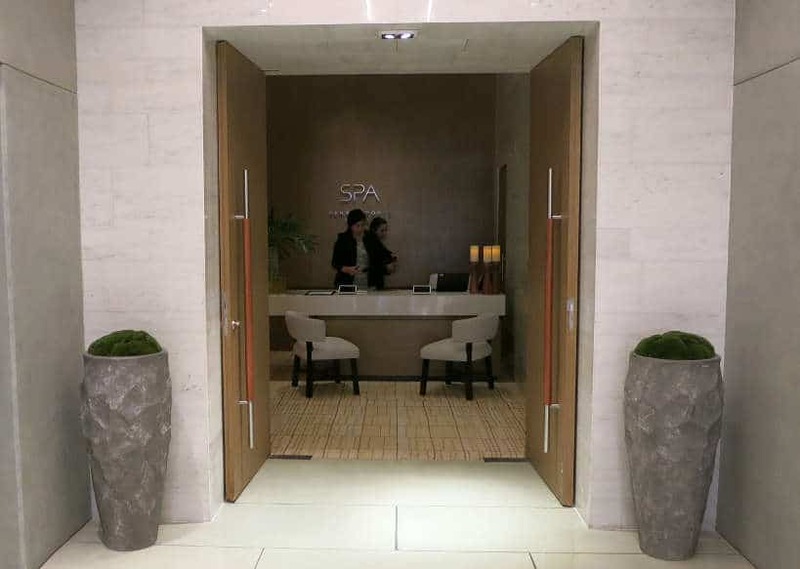 We did not have the chance to experience the urban spa, but you can find out more about the services and prices offered here. If you are traveling with children, you will be pleased to discover the Adventure Zone. This multi-level playground is designed to exhilarate children of all ages. You will find a Toddler Zone for children under 4 years of age. 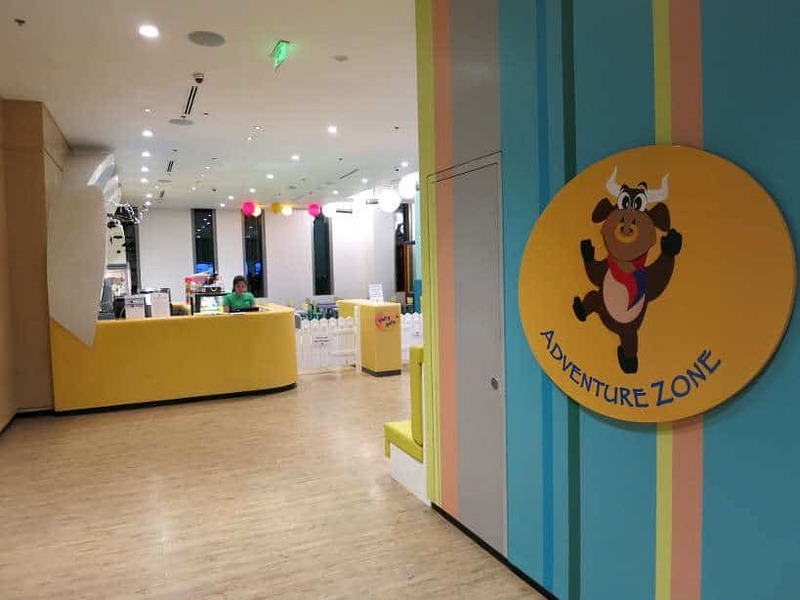 And for those with older children, there is a Game Zone with activities, board games, arts & crafts and digital games to stimulate the creativity for those between 5 years to 12 years of age. The best way to enjoy the Kerry Sports is to be a guest at the Shangri-La at the Fort in Manila. 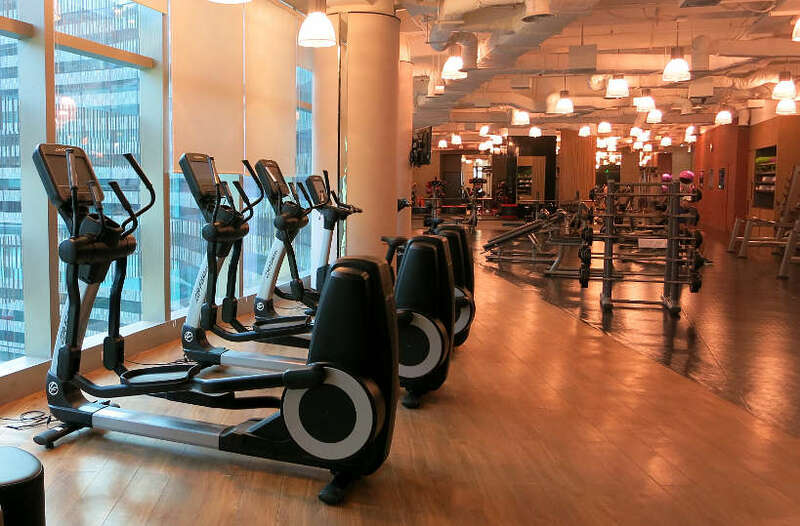 As a guest, you have access to the fitness center and can exercise and unwind at the expansive two-floor lifestyle club. If you are curious about the rooms, see this is a sneak-peak video below. This video is shot in 360, which allows you to use your mouse to scroll around and get a taste of the luxury that awaits you. If you are interested in becoming a member of Kerry Sports, you will have unlimited access to the facility, including group classes, fitness equipment, and the swimming pool. For more information about the membership rates, click here for the details. Unfortunately, Kerry Sports does not offer day passes. However, members can bring guests along with them for an additional PHP 1,000 (approx $20.13 USD) for a full-day experience. Spending the day at Kerry Sports goes beyond simply a day at the gym. 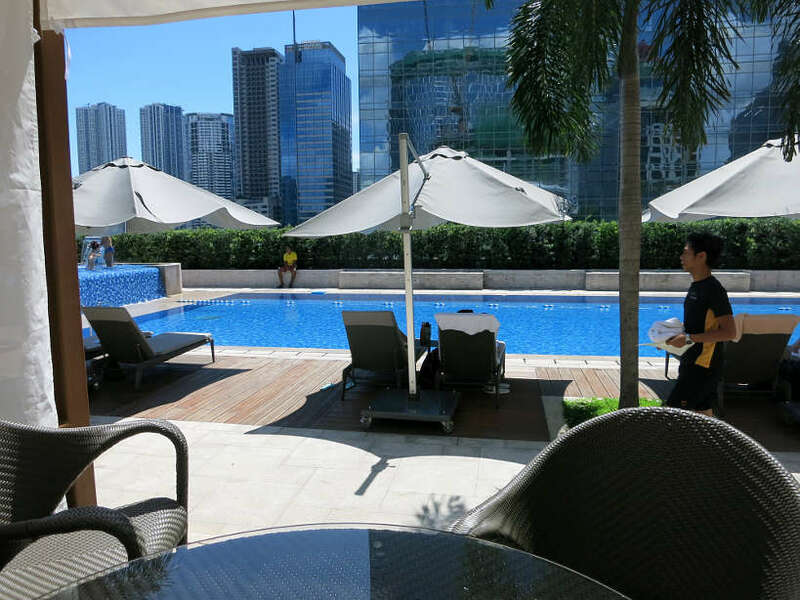 This is really a destination where you can spend all day in a ‘private oasis’ in the middle of Manila. With all the indoor and outdoor fitness and relaxation options, you can really find your own space at Kerry Sports. If your travels take you to the Philippines, staying fit does not have to be complicated. You don’t have to abandon your fitness routine. 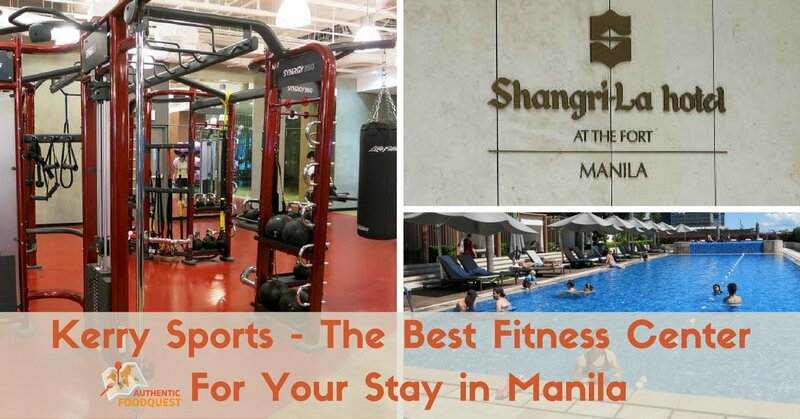 Simply book your stay at the Shangri-La at the Fort, Manila, and make Kerry Sports your fitness partner. At the largest sports center in the Philippines, you will find everything you need to keep you and your family fit and entertained. Kerry Sports, Manila, Level 5-6, 3rd Avenue cor. 30th Street, West Crescent Park, Bonifacio Global City, Taguig City, 1634 Metro Manila. Now it’s your turn, please tell us how you stay fit on your travels? Share your tips and recommendations below! Disclosure: Our stay was provided by Shangri-La at The Fort, Manila Philippines. All thoughts and opinions are entirely our own. This article contains affiliate links. When you book on Agoda.com through our affiliate site, we earn a small commission at no additional cost to you. 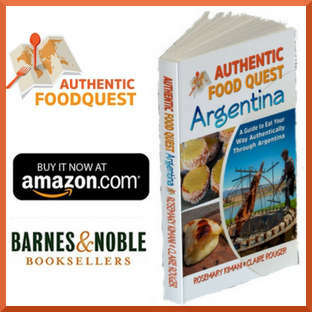 It just helps us keep eating our way around the world at Authentic Food Quest! Great pics & just the thing to throw yourself into after a holiday where you’ve indulged a little too much in the foodery!! I’d love a good yoga session, maybe a dip in the pool and followed up with a sauna. Thanks Anna for your comments. You can’t beat working out and staying fit when traveling for food 🙂 Yoga, the pool and sauna are perfect, especially at a great fitness center like Kerry Sports. Check them out if your travels take you to the Philippines. Cheers! Impressive studio and a great and thorough review. I’m in Manila right now, there is a gym in the hotel I am staying, but it is nowhere near the one you are describing here. Maybe need to look into that again for my next trip. Thanks! Hi Goni, so glad that you enjoyed the review of Kerry Sports. Glad that you have access to a gym right now in Manila. Do keep Kerry Sports in mind for the next time. 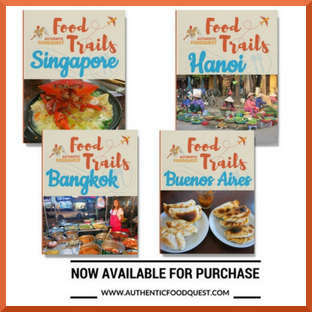 Happy travels and eating in the Philippines. Cheers. wow this looks sooo amazing! I’m visiting the Philippines in a couple of weeks and I’ve heard it’s not the best place for a solo female traveler. What do you think?? Hi Felicia, as with travel anywhere (even at home), be cognizant of your surroundings and you will be okay. We felt pretty safe walking at night and in the local areas. You will have a great time. As you indulge in all the Filipino delights, don’t hesitate to check out Kerry Sports….Thanks for your comments and feel free to reach out with additional questions. Safe travels. Wow, this sports center is amazing! I’m a tennis player, so I’d love to hit on those courts. So many ways to get a great workout in and that pool looks awesome! Thanks Kaylene, for your comments. Kerry Sports is indeed impressive and you would really enjoy the tennis courts and amazing pool. Hope you can check it out for yourself soon. Cheers! You are right Faith, a little wellness and spa time is always a great idea. 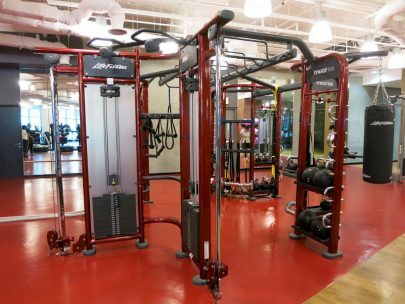 Kerry Sports packs it all in and give you the chance to find your space at the fitness center. Thanks for your comments! We have to agree, the pool is indeed incredible, including the private cabanas and very friendly staff. 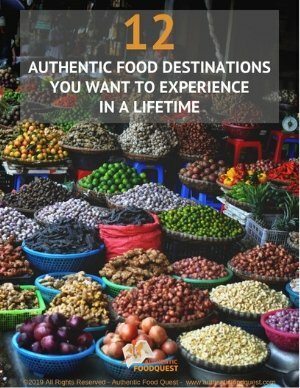 A great place to check out for your next trip to the Philippines. Thanks Zoe, for stopping by! Good to know! 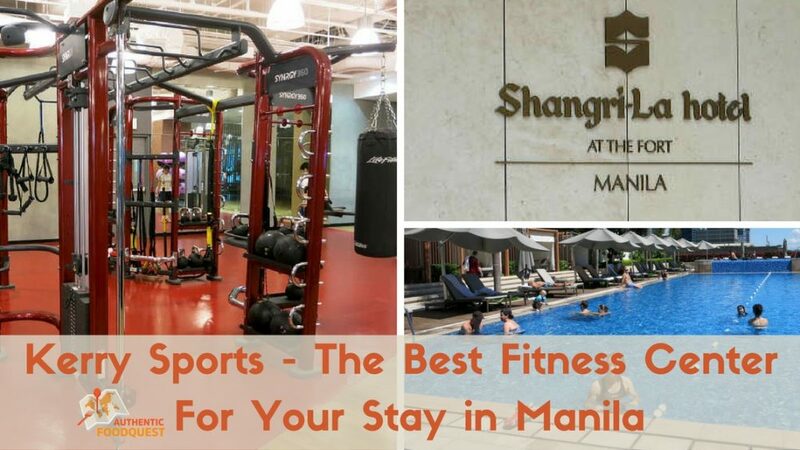 If it happens to stay more than a few days in Manila, I know where to find a nice fitness center! 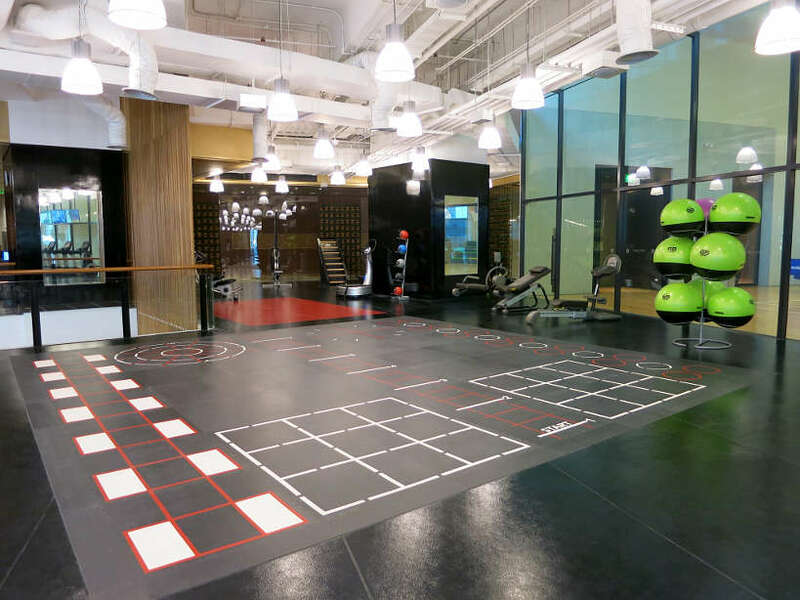 Having a great place to work out on your travels to Manila is essential. Hope you get a chance to check out Kerry Sports. Truly amazing!! Thanks Simona. Hi Anya, when you eat for a living, exercise and keeping fit takes on new meaning. Kerry Sports and the Shangri-La offer a great balance of fitness activities and relaxation options. It is possible to do both and enjoy 🙂 Thanks for stopping by. You have just reminded me how I need to get back in shape. Unfortunately when I travel, I mostly go to remote places where with natural treadmills 😂😂. I would like to try the Vinyasa Yoga. Kerry Sports is huge, well equipped and makes one long for fitness. Great post. Nice photos as well. Thank you so much Bonita. Really glad to hear you enjoyed the post and photos 🙂 As long as you have options on your travels, that’s awesome. 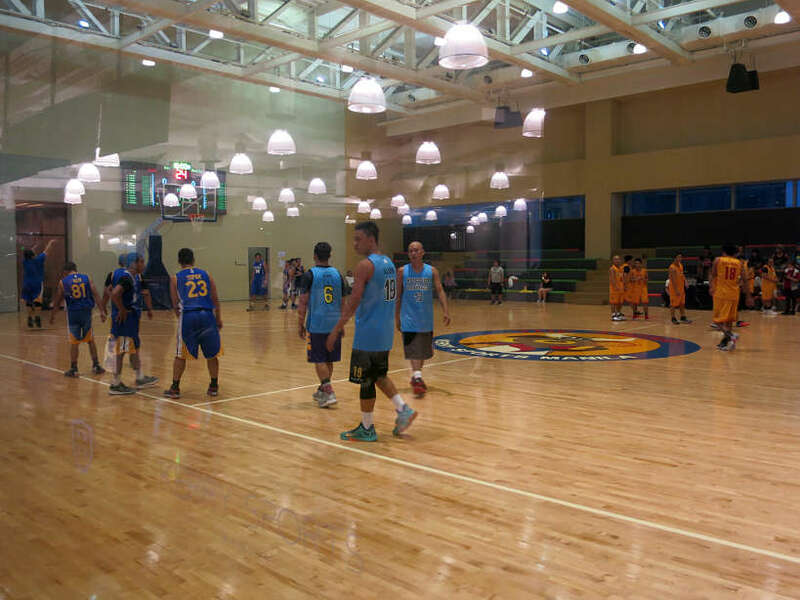 Kerry Sports is a great option for those without any options in Manila. Wishing you safe and active travels. Cheers! It is true Emma. Having a fitness center with as many options as Kerry Sports, does make it easier to stay fit while traveling. Thanks for your comments. Love the details. I’m Filipina and go to Manila every so often. Thanks so much for this. I agree it’s hard to find places to run in the city. I didn’t even know about this place the last time I was there. I have only gone to Bikram yoga as I’m a huge fan of it. Now I can add this next time I’m there. That’s awesome that as a local you agree with our assessment of the difficulty in finding great places to run in Manila. Fortunately, Kerry Sports gives you many options and choices. Do check it out the next time you are in Manila.Thanks for your comments!! Such an amazing place to stay. 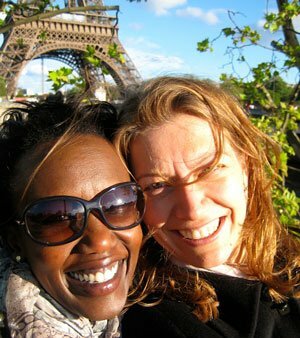 Love this post, thanks for sharing these photos with us, Claire and Rosemary! You are most welcome Agnes.If you are planning a trip to Manila, do not hesitate to check out Kerry Sports!! Appreciate your comments.